Shuttling on the West Coast Wilderness Trail from the very beginning. Every once and a while an opportunity comes along that allows you do something really special and rewarding. So if you enjoy the great outdoors and you can get your leg over a bicycle then come and experience the new West Coast Wilderness Cycle Trail. This trail literally has everything this beautiful unspoiled part of New Zealand has to offer. 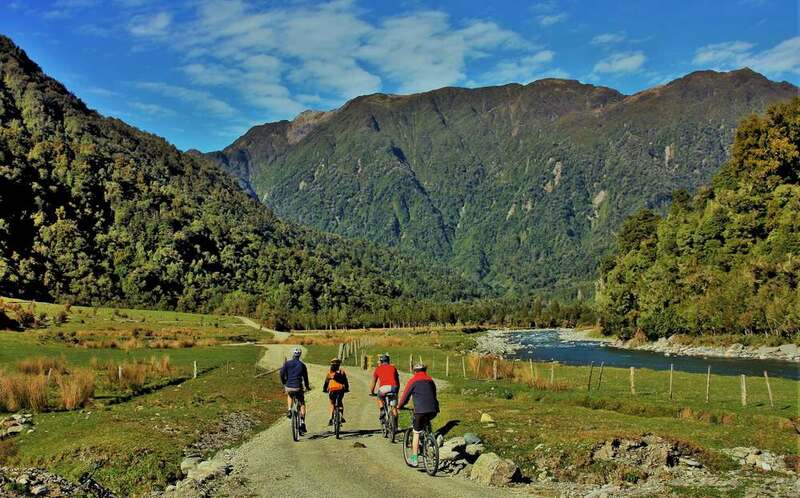 Against the backdrop of the majestic Southern Alps the trail threads its way through a diverse range of natural landscapes; Rainforest cloaked valleys, pristine rivers, picturesque lakes, unmodified wetlands and driftwood strewn beaches. Throw in a rich mixture of heritage and local characters and you have the perfect recipe for a great adventure. Even better it is easy Grade 2 riding. The few short sections that involve climbing are in the most spectacular parts of the trail and are just as enjoyable to walk. The trail surface is of a very high quality and makes for easy and comfortable riding. We are a locally based company operated by a couple who are passionate about the West Coast and totally enthusiastic about the trail. Let Wilderness Trail Shuttle make it happen for you. We are committed to ensuring your complete enjoyment of the trail by providing a professionally run shuttle service that can transport you and your bike to all points on the trail or pick you up at the end of a days riding. We have plenty of local knowledge and are keen to help you with all aspects of your planning whatever your budget. We look forward to hearing from you so please don’t hesitate to contact us.